London - Cardiff claim they are shocked by a report that the pilot in the plane crash that killed Emiliano Sala was not qualified to fly at night. The Premier League club said they remain "deeply concerned" that the pilot David Ibbotson and those who arranged the flight "seemingly completely disregarded the rules of flying and put Mr Sala's life in such danger". 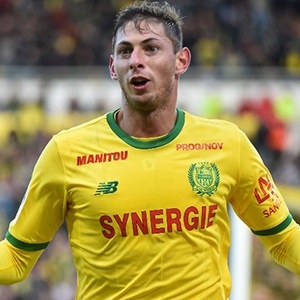 Sala died when the Piper Malibu aircraft they were travelling in came down in the English Channel on January 21, two days after Cardiff had signed the Argentinian striker from French club Nantes. The BBC on Saturday reported Ibbotson was thought to have been colour-blind and that his licence restricted him to flying in daytime hours only. Cardiff said in a statement: "Cardiff City is shocked to hear the pilot, David Ibbotson, may not have been permitted to fly at night. "The club remains deeply concerned that the pilot, and those who arranged the flight, seemingly completely disregarded the rules of flying and put Mr Sala's life in such danger. "We believe those who are responsible should be held fully accountable for their actions. "We reiterate our support for the Air Charter Association's call for more awareness of and better enforcement against illegal flights."